There are an awful lot of these, so here a small selection. and an untitled post by film-maker David Lowery in Drifting: a brief, clear-sighted over-view. Code Unknown Darren Hughes in long pauses, which takes on Haneke’s use of photographer Luc Delahaye’s L’Autre series. the imdb user reviews of Code Unknown, which go into many pages (66 reviews in all) and from which one can glean many ideas, and different ways of explaining the same thing. Shortly before the incident when Jean wants to go to Anne’s flat, the latter tells him the code of her flat: “if you want to enter my flat, the code of my building is B4718”. I’m not sure whether it’s the right code but the building could epitomize a metaphor of a man’s life. Every man’s life is similar to a building kept generally by a code. The title of the film is rather easy to understand. The famous “unknown code” is a blocked access to any character’s real life. This code is unknown for the strangers who surround him or her and as a consequence they don’t known anything of his or her real life. It’s this situation that is represented in Haneke’s movie. (above in the part of his son in Caché, squaring up to George in a TV studio corridor) playing the teenage Arab who taunts Juliette Binoche in Code Unknown. Both in this earlier film playing different parts to those they took in Caché, yet seeming for a moment as if they are playing the same parts at an earlier stage in the same story : the tube train (metro) scene where Anne is harassed almost as if it might have been a moment in the earlier life of the Anne of Caché. Though, of course, in Caché the taunter and the passive man of Code Unknown are father and son. And it doesn’t look like they are related in Code Unknown! But who knows what is in Haneke’s mind? Even if these films are watched chronologically, rather than the other way round, it might pop into mind that these two sets of characters were in some way part of an on-going story. They are, in a way, because they are taking the parts of the same type of characters: the marginal immigrant from North Africa and French-born son. Though one thing that is apparent from both films is that Haneke wants us to see that the boys in both films are French by birth, and yet still perceived as foreign, a threat, to the George and Anne’s (and Police) of the world. The difference between the two films is that in Code Unknown the boy is seen to be behaving inappropriately. A young, French-born Arab taunting a middle-class white woman in a metro train. With added irony – it is an immigrant (going by his age) not a white passenger who in the end defends her. part of Haneke’s purpose here, resumably is to show the races just don’t mix. For dramatic tension the North African man come to Anne’s defence once the absue is over and the two hooligans are about to leave the metro carriage. He squares up to the main culprit, but one feels after the damger has passed. In the horrible seconds, which seem like minutes, before he does so, he sits passively looking forward, not engaging as do the other passengers. We as viewers know full-well he and the other pasengers are petrified too. If they haven’t experienced a mugging, they know all about it from the media and the the prevelence of guns and knives. This ‘paralysis of non-intervention’ is a universal theme: London, Paris, New York: you might get yourself stabbed or shot in any big city. Even if you are morally and ethically aware of the need to act, it is ‘epoched’ for your own survival. 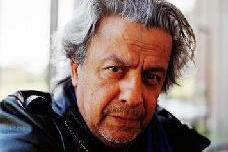 So, although a French film with French issues, that bit travels easily to audiences from other cultures. In a Hollywood movie the good guy stands up a lot earlier. In Caché, neither the Arab man or his French-born son are seen to be doing anything to upset George, except – in the case of the young man – to have the confidence to be able to defend himself verbally against accusations from George of being involved in the ‘harassment by video’. The father defends himself – but in a more passive way, stating simply and repeating it, that it wasn’t him – indicating that he feels less confident than his French-born son about his position in French society. The older man has of course, we see, clearly been beaten down by the circumstances of his life in France. He probably hasn’t got a job or any prospect of one any more, living in the despiriting enviroment of the banlieu government housing blocks. If you have watched Caché, you will know the father’s final response. Both the simple denials, and the final shocking act, are the things that make those who watch these films who have read about France and its colonial past, reflect back on the gory history of relations between France and Algeria. Read Alistair Horne’s The Savage War of Peace, Algeria 1954-1962, to learn about the number of Algerians who died over the whole of France’s control of Algeria from 1830. In the first long scene in Code Unknown, where many of the character’s lives cross – they are almost artificially put in conjuction with each other for a moment by the will of the director in his long tracking shot up and down the Boulevard – the tension is created by the assumption amongst the whites, including Anne, the two policemen, and onlookers that the young black African man, Amidou, (possibly here, taking the part of the born in France generation) has been accosting the brother of Anne’s boyfriend. The one person who knows the truth – the Romanian begger, Maria, who was at the centre of the incident – can’t speak French, but in any case, wanders away from it because she fears being caught for being an illlegal immigrant. Even when the young black man, Amidou, explains that Maria witnessed the whole thing, pointing her out as she tries to scurry away, she is only dealt with by the police for her flouting of the law, not to find out from her who caused the fisticuffs between the two young men. We later learn that Amidou has been roughed up at the police station, but not that guilt has been established. All very nastily racist. One is tempted to say that this is particularly French racism. We have seen racism in US and European films, and on real streets, but they all have their own special features. If you watched Caché before Code Unknown, you will immediately recognise the same rising anger in yourself recollecting the scene where George the TV presenter, gets angry with a black cyclist in the street, who appears to have done nothing wrong except cycle a bit too close to the two pedestrians, George and his wife Anne. 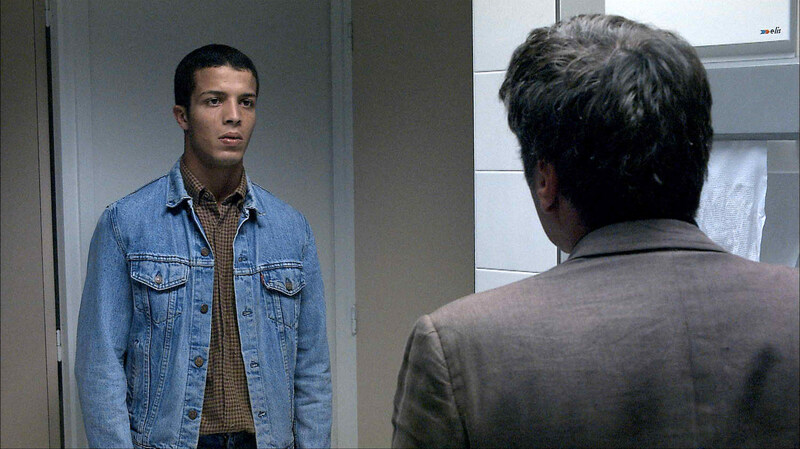 Tellingly, in Code Unknown the young black man is pepared to argue back – here with the Police – just as the Walid Afkir character in Caché does with George. In that case it’s over the innocence of his father, who unlike his son, won’t really defend himself against George’s repeated accusations that he was behind the sending of ‘staking’ videos. Whichever way round you watch these films, these scenes seem like reprises of each other – a standard confrontation between indigenous white and immigrant (or first generation French-born) black – all rather ugly. 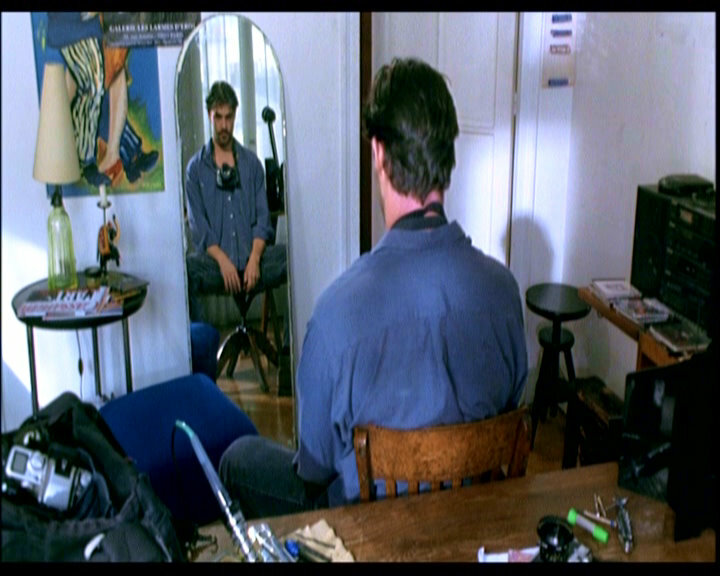 In the final scene in Caché there is a hint that the younger generations might be getting on better than their parents, but there is no such a resolution in Code Unknown. The general feel is of communities being widely separated. This is exemplified by the African family, who are given ample opportunity in long scenes to show how they live very un-French lives, strikingly shown by the women’s respect for the taxi driver (either as the head of the family, or as an elder of the community, or both), and how the mother of Amidou resorts to asking the elder/husband to interpret dreams she has had in what looks like voodoo minus the bones. The idea seems to be that [a] she hasn’t got out of her old superstitions despite living in a modern European democracy, [b] that this approach is all she has in a world where the immigrant is not treated on a par with the white. In Caché, the middle-class intellectuals talking over diner about the iconic, real 1962 incident in Paris in which many Algerian protesters were shot by the Police and dumped in the Seine. There is no shame of guilt amongst the exclusively white diner ensemble. The historical incident has come to the fore in the film because George remembers the two immigrants who his parents looked after and had working on their farm, who had never come back from the demo. 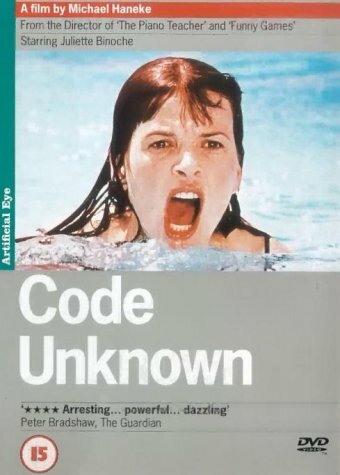 Dennis Cozzalio’s description and analysis of Code Unknown is a good, clear starting point. Though there are a range of online responses to the film which tackle it in different ways. This tends to back up my idea that when you think about Haneke films you don’t often take them from the beginning and work through to the end. ….complexity or sublimity of Haneke’s meditation on racism and classism (amongst other things). Handy, too, for the set of stills and his cinematographic analysis of the beggar scene. I haven’t come to a overall conclusion, except that Haneke is not a director for standard movie resolutions. Or even explanations. Starting at the beginning and working my way through describing everything in the film has no appeal at all. Once you’ve read a dozen summeries and analyses by others, it seems rather superfluous. Although each viewer has his or her own particular places of interest, as I have. It seems more fruitful to grab scenes and work to the centre (or the edge? ), as it were. Like a mountain one thinks of climbing because it is there, having blog space means one tends to make marks of some sort, but leave gaps to add more. Cutting within the scene, Haneke reverts to conventional film grammar—and, in the process, calls attention to the scene’s artifice. It doesn’t take long to realize that we aren’t watching a scene in Michael Haneke’s Code Unknown but from something tentatively called “The Collector,” a film within Haneke’s film. In Code Unknown, Binoche plays an actress named Anne; in “The Collector,” Anne plays a woman in distress in what seems like a thoroughly generic thriller. The wonder of the pool scene is how Haneke takes that most mundane of tropes—the shot-reverse shot—and makes it strange, even revelatory. Juxtaposing it against a succession of Bazinian long takes, Haneke’s simple cut becomes a formalist critique of cinema. I think Hanke would love this “Haneke’s simple cut becomes a formalist critique of cinema”. But not necessarily in a positive sense. Watching that sequence (scene 35 of 43), which is the last film-within-film, we certainly might start ( because there is time in the shot) by asking where that man in the pool comes from – he’s not been in the film up to now – who is the kid and what is she doing in a penthouse swimmimg pool? We might at first incorrectly assume it was just another part of Anne’s life Haneke was introducing almost at random. Was it something before or after? After all there are random cuts in the film that would put Godard to shame, so why not an unexplained scene from somewhere else in her life which bears no relation to the on-going events? Once Anne has acted in a shot from her acting work (scene 4 ) we are cued to expect she might be in film-within-film again. Anne is taking the part of someone who seems to be locked in something like a rusty container. (It turns out to be a room that has had its windows blocked off – in one shot Anne is shown opening a shutter to a newly bricked up window.) Before she starts acting, she looks towards the camera in medium shot, listening to the director’s instructions from off-frame. Then we get her acting/emoting in close-up. There is a sharp cut – in the middle of her acting – to George the photographer’s brother sitting at a table eating. I rather like the idea that the character Anne, played by the actress Binoche, taking a part in film[s] within a film, can magnificently express a heightened emotion that she might not be able to do as the character Anne in her own story. A good example of her real-life ineptitude being the supermarket shots with her boyfriend. The next time Anne is shown doing some acting is scene 14. Almost immediately there is a shot from behind a mise en scene film crew, filming her as she enters a room as a character being given a viewing of a flat. It is not until three-quarters of the way through Code Unkown that we see a scene (#36/43) of Anne dubbing sound onto the film. At first we might think it is Haneke directing the part Anne acts, but soon we see it’s a film director off shot in a film-within-a-film. We recognise someone else is directing this film-within-a-film, but see Haneke created, scripted and directed him it and him. Without slipping into unnecessary preciousness, we might say Haneke is responsible for his own style of filming and editing, and the director character (s) who control(s) the films with the film is ‘in control’ of his standard filming and editing style. They are from separate film worlds. Even though everything in the film is Haneke’s. The cumulative effect as one turns the pages is hallucinatory in its intensity: The sameness of the compositional schema throws into relief not only the physiognomic distinctness of the individual subjects but equally their uniform determination, as it comes to seem, to absent themselves as much as possible from their immediate circumstances. Haneke goes two stages back: we do not just see (and react to) the photographs as we might in a gallery or coffee table book. He shows us a montage of George’s Kosovo war photographs with a voice-over of George reading a letter out. ( I was reminded at this poit for some reason of how Don McCullin went off war photography.) Then we see George (scene #24/43) sitting in Anne’s flat alone, relaxed, taking his time carefully preparing to go out to take photographs. He tightens a nut on the camera mounting, then practices putting the camera round his neck, with the strap adjusted to position the camera high up on his chest, checking in the mirror to see what it looks like (from the point of view of the oerson whose photo is being taken). Anyone who uses a camera regularly in different ways might have felt a slight constriction at the unnaturally high position of George’s camera, wondering what he wanted to take pictures of. (For some reason I can’t explain, I was reminded of seeing a framed portrait of Nasser strapped high like that on the chest of an angry Baghdad University student we knew in the days just after the 1958 Iraq Revolution). But of course it means only one thing, he plans to take close-ups. Taking candid shots say from over 5 meters away, it’s fine to sling the camera at belly level, which feels comfortable, points the camera parallel to the ground, and does not look as if one is necessarily going to take a photo, just that the camera is being carried. There is no need for a cable release. No one notices you taking pictures because you are not holding the camera up to eye level. George attaches a cable release which he hides under his clothes and practises using it. We hear the shutter release clicking. In the next scene, we see why he wants the high position when he sits down in the underground train carriage. This is confirmed by showing the line up between the camera and the head of the first person to sit opposite him with a camera angle over the woman’s left sholder. Even so, it might have to have been a wide angle lens rather than 50mm, for him to be sure to get the heads in his photographs without framing by eye. There is another way of cutting these scenes:leaving out George’s preparation for photography. First we see the war photographs and the commentary in the form of George’s letter, then we cut to George with a camera round his neck walking down a carriage to take a seat opposite a woman. It is a big jump, and requires a lot more filling in of gaps, but we can see immediately he is doing something different from what we assume is his metier, the war photographer. And we would ask why and come to a conclusion. Putting in the build up stages, as Haneke does, allows the viewer to wonder what he is going to photograph, and then have it either confirmed or refuted by the shots of him taking clandestine photographs. And finally individual photographs of Delahaye’s of commuters are presented one by one. There is a much more nuts and bolts way to think about what a photograph is. Part of this is that it can lack a context. Whereas in Code Unknown both text and film have a before and after, an individual still — unless for example, it is a part of a set of closely consecutive frames show side by side which shows some sort of progression — has largely been removed from its context. It has also been removed from its context because it is a frame of a particular section of a view that existed at the time the photograph was taken. The shot in the film of the girl lying on the ground with what looks like a dead dog (this seems to be Luc Delahaye’s work, too) could have been framed slightly to the left, and standing to the side of the girl might be a western film crew, filming her distress close up. That is very different picture from what seems like desperately lonely girl needing help and support, and therefore a universal image. A photograph on an art galley wall might have an inscription, say, Sarajevo 1993, which is like removing a piece of reality in the form of a still photograph – a particular place, a particular time – and stitching to it a keyword to re-evoke a context. But what each individual evokes when seeing the word Sarajevo will be different. Someone who had read and seen a great deal about Sarejevo and the Bosnian War will have a rich context, while the person who has no idea where Sarajevo is, will have little. That does not mean to say the photograph will not have an impact for the person who knows nothing of the place where it was taken, but it will be a very different experience. A dead body in Sarejevo is not the same as a dead body in a Chicago street because it has a different story behind it. If a photograph has no label, the viewer try to work out the context. 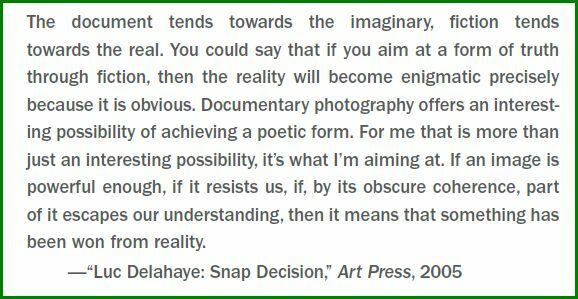 To say ‘if an image is powerful enough, it resists us, if, by its obscure coherence, part of it escapes our understanding, then it means that something has been won from reality’ must be understood in that sort of context as well. A photograph has a set of correspondences with the real event it attempts to record, but all the signs and signifiers of the scene are not there in the photograph (for example, the smell and sound as missing), though cues to three-dimensionality and questions of figure-and-background are still available. These have to be ‘added back in’ by the person looking at the picture, from information in it, or simply by a process of mental evocation from sources outside the photograph. Maybe Haneke thinks he can do the same thing with film that Delahaye thinks his photographs achieve. Hence, for example, he can cut off shots before their natural endings. to ‘win something from reality‘. Without being able to explain why I see Haneke’s films (I’ve seen Cache and Code Unknown so far) as barometric films as opposed to others which might be termed chronometric. An aneroid barometer with the moveable needle left where it was set 24 hours before, shows whether the air pressure has dropped or risen in that time and by how much. But a barometer without a moveable needle has this vital piece of information missing. A baromoter without a manual needle does not tell us whether the pressure has gone up or down and by how much in that 24 hour period, unless the readings have been recorded at regular intervals. The visual impact of seeing the two pointers compared is immediate, whereas referring to recorded data to work out if the current reading is higher or lower, is not. The fine detail is still missing from this image, however, because in the set time (say 24 hours) the moveable needle has been left in position, and the barometric pressure might have gone up and down and then back up again. In a sense, Haneke’s cut of the clandestine camera scenes has shown fingers moving the two needles together, then cut to show the barometer with the needles apart. Which is not the same of two shots of a clock, showing time has advanced. The pressure changes are an indicator of what weather might be coming. And weather is a complex phenomenon. A clock shows time has passed, and indicates that something might have happened in the interval, that we don’t see or know about.